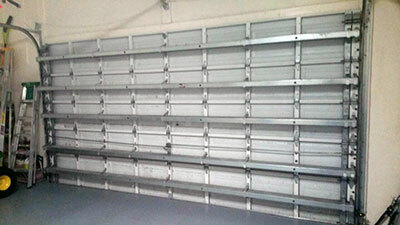 Like any other complex system, your garage door requires proper maintenance. It should include inspection, lubrication, safety checks and if needed various replacements. The components which are most likely to get dirty are the tracks. They may get pieces of dirt, grass and even small pebbles at the bottom. These should be easy to remove with safety gloves. It is possible to use solvent, brake cleaner or another safe and potent product for removing traces of dirt mixed with lubricant along the entire length of the tracks. These components and especially their lower ends should be checked for rust during garage door maintenance. Rust remover which is safe for galvanized steel should help to deal with the problem. The other hardware parts should not be dirty unless they have been lubricated with the wrong type of product. If there are sticky or hard lumps, they should be removed with solvent. The components which require lubrication at least once a year include the torsion spring, bearings, hinges and rollers. If the roller wheels are made from nylon rather than from steel, lubricant should be applied only to the stems. The ideal product for the purpose is not sticky and does not contain silicone. It is best to use lithium-based spray. Lithium prevents the compound from hardening even if it gets very cold outside. As a result, the risk of the overhead door getting stuck in the winter is minimal. The opener’s drive chain or screw should also be lubricated. The same applies to the sections where the trolley contacts with the rail. The choice of lubricant depends entirely on the instructions of the opener’s manufacturer.